The combination of several different techniques and the use of various materials has developed my art into a form of "collage on canvas'. This includes acrylic paint used with paper, fabric, dried flowers, bark, seeds, glass and china pieces. 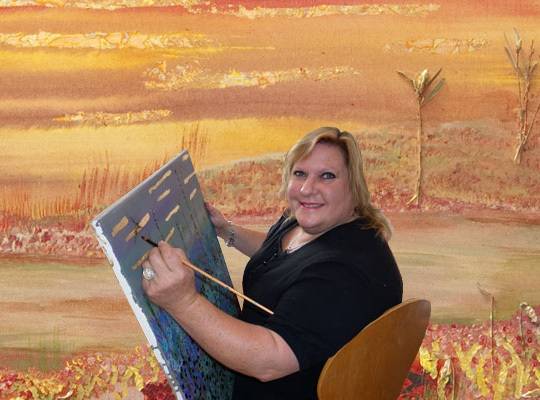 I take my inspiration from my surroundings, and like to create paintings that are full of life, color and texture which gives the canvas a "3 Dimensional' appearance. The use of different textures gives the paintings a feel of movement, and of bringing the outdoors-indoors. My work is made to order, and you can choose the size of the canvas, the colors and the 'mood'. Prices will vary slightly depending on the size and detail required.